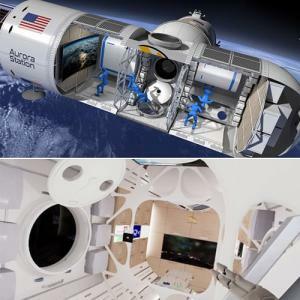 Interior renderings of the world's first luxury space hotel, Aurora Station, were unveiled Thursday for the first time.Developed by US-based space technology start-up Orion Span, the fully modular space station will host six people at a time, including two crew members, for 12-day space travel tours. It plans to welcome its first guests in 2021 - a year earlier than the 2022 date announced in April 2018. "Our goal is to make space accessible to all," Frank Bunger, CEO and founder of Orion Span, said in a statement last year. "Upon launch, Aurora Station goes into service immediately, bringing travelers into space quickly and at a lower price point than ever seen before." While a $10 million trip is outside the budget of most people's two-week vacations, Orion Span claims to offer an authentic astronaut experience. Says Bunger, it has "taken what was historically a 24-month training regimen to prepare travelers to visit a space station and streamlined it to three months, at a fraction of the cost." During their 12-day adventure, the super-rich travelers will fly at a height of 200 miles above the Earth's surface in Low Earth Orbit, or LEP, where they will witness incredible views of the blue planet. The hotel will orbit Earth every 90 minutes, which means guests will see around 16 sunrises and sunsets every 24 hours.